The legendary singer died on Thursday, August 16, in her Detroit home after being diagnosed with pancreatic cancer. Franklin, 76, was surrounded by close friends and family in her last moments. Franklin, who was know for her hits Respect and Think, was one of the most celebrated American musicians garnering respect from artists around the world. On Thursday, NASA reminded Franklin may have died but her celestial namesake – an asteroid dubbed Asteroid 249516 Aretha in her honour – will forevermore fly through the deep dark depths of space. NASA tweeted on Thursday: “We’re saddened by the loss of Aretha Franklin. Asteroid Aretha was discovered on February 15, 2010, by NASA’s NEOWISE asteroid hunting mission. 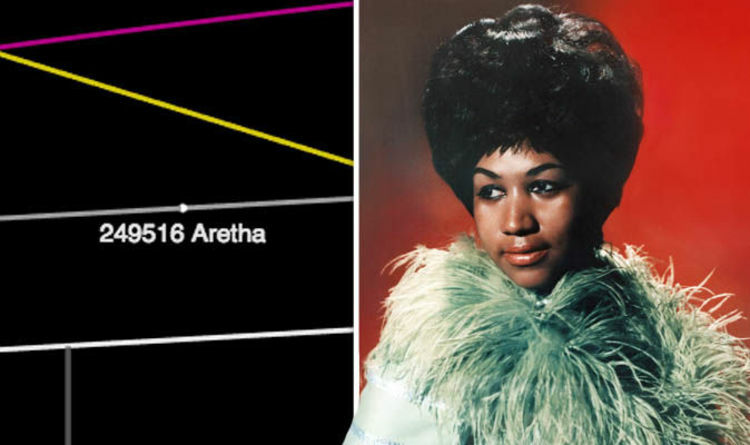 If the asteroid’s path remains unobstructed for the millennia to come, there is a good chance Aretha will continue to orbit the Sun long after the star dies out. Asteroid Aretha measures roughly 2.7 miles (4.3km) in diameter and belongs to the Veritas family of space rocks, created from the stellar collision of planetary bodies. The majority of Veritas asteroids can be found in orbit between the planet Mars and the gas giant Jupiter. Asteroid Aretha will next approach Earth on the night of September 2, 2035, followed by another appearance on April 21, 2046. Under the asteroid’s official designation at NASA’s Jet Propulsion Laboratory (JPL) the space agency included a little biography note on the space rock’s namesake. NASA wrote: “Aretha Franklin, born 1942, is an American singer know as the Queen of Soul who has won 17 Grammy Awards and has influenced countless singers. During her career spanning more than five decades, Franklin has won numerous accolades and awards for her soulful blues music. She has had more than 100 singles on the US Billboard charts, has won 18 Grammy Awards and starred in the hit musical Blue Brothers. Franklin’s family issued a statement after her death was confirmed, saying: “We have been deeply ached by the incredible outpouring of love and support we have received from close friends, supporters and fans all arid the world. “Thank you for your compassion and prayers. Asteroid Aretha joined a plethora of other asteroids NASA has named after civil rights activist around the world. Among these named space rocks are Asteroid Malala, named after Pakistani Nobel Peace Prize winner Malala Yousafzai, Asteroid Harriet, named after American slave trade abolitionist Harriet Tubman and Asteroid Rosa, named after civil rights activist Rosa Parks.